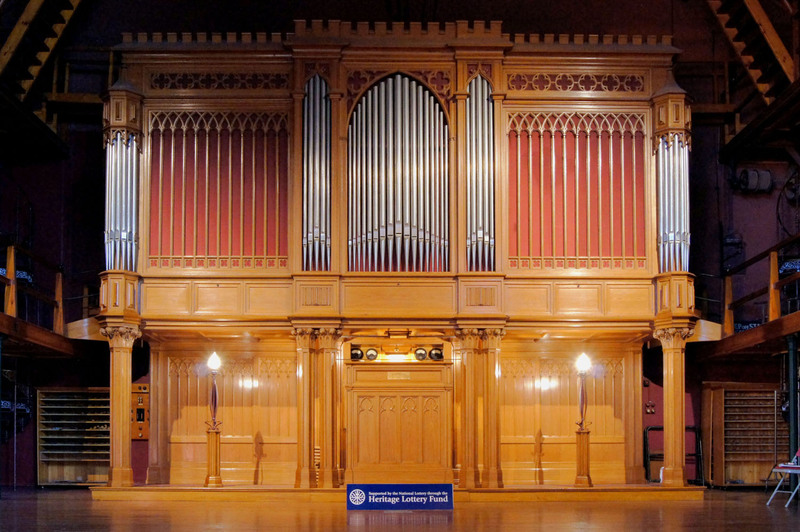 The first large self-playing organs were intended to imitate an orchestra and were equipped with ranks of pipes voiced to represent various orchestral instruments. Because they were large and extremely expensive to build, they were often exploited commercially, being exhibited in halls to which the public paid an admission charge. Flight & Robson’s famous Apollonicon, a combined automatic and manually-played organ, was one such attraction in the early 19th century London. Their large size and impressive music, loud enough to entertain a large audience, made them a commercial proposition. The impressive Welte Philharmonic organ built for Sir David Salomons in 1914 and installed at his Tunbridge Wells (UK) home, restored with help from the Heritage Lottery Fund. A number of firms specialised in the construction of orchestrions, which became a special branch of the mechanical organ trade. Two of the most famous were M. Welte & Söhne and Imhof & Mukle, both based in Germany’s Black Forest region, but there were many more. Towards the late 19th century, orchestrions had achieved an almost world-wide popularity and were to be found as far afield as Russia, South America and India. Naturally the ownership of such an instrument came at a heavy cost and a glance at Welte’s client list reveals the names of crowned heads of state, Maharajas and American industrialists, to name but a few. They were to be found in the ballrooms, entrance halls and music rooms of country houses, palaces and castles. Another significant area of use was in places of public entertainment, such as hotels, spas, pleasure gardens and skating rinks. For decades the music was encoded as pins and bridges on large wooden cylinders (barrels) and some orchestrions were supplied with special matching cabinets in which 20 or more could be safely stored. The Welte firm made a significant improvement by the introduction of operation by perforated paper music rolls; other makers quickly followed with their own versions. Prior to the introduction of electricity, instruments were powered by heavy weight-driven clockwork motors which had to be wound up before a performance. A number of years ago we had a major part in the Heritage Lottery funded restoration of the largest extant Welte orchestrion located at Salomons, near Tunbridge Wells. We believe this to be the most complex automatic musical instrument in the United Kingdom. It was built in 1913- 4 and combined Welte’s largest orchestrion type, the Style 10, with their latest development, the Philharmonic Organ, which could re-enact the performances of famous organists with breathtaking realism. Today it is the only remaining Welte organ able to play Style 10 Concert Orchestrion rolls and the only one equipped to play both Orchestrion and Philharmonic rolls. We also have experience of Imhof & Mukle orchestrions playing from cylinders as well as their patented “Notenblätter” (music sheet) system. The large format of many orchestrions makes them close a relative of the organs which played on fairgrounds; both Welte and Imhof also supplied special instruments for this purpose. Buy an audio CD of the Welte Philharmonic Organ here.